As I contemplate my birthday today (written on birthday) I wonder about Love Month this year. Each year since I began this blog I have chosen February as Love Month and write something that I hope will inspire you to Love Unconditionally … or choose Love over fear. This has been quite the last couple of years for me with loss and my first birthday without my mother. I know this puts me in a contemplative mood and helps me to wonder about new possibilities. We all aspire to Dream Big on our Birthdays and focus on all the Magic that may transform over the coming year. I know that Love is important to me but it isn’t just the love of another I seek but to also Love Unconditionally and create Acceptance in my Life. These are my goals this year and I strive to fully embrace this as my State of BEing. It is said, however, that if you are truly ready for a Beloved in your life then the Beloved would show up. So what am I missing if I don’t have that love with another? I feel that Self-Love is the area that I continue to seek clearer understanding. Seeing oneself as a Beloved will attract a Beloved. Tom Campbell says we already ‘Love’ ourselves, but don’t necessarily ‘like’ ourself and he spoke of the problem with narcissism in our latest show. We – or I – focus on areas that I want to fix – my health, my addiction to sugar, my body image. This year I experienced the worst sugar detox flu as I am determined to end my addiction to sugar (as I thought I had many times) and then as soon as that balanced itself out, I managed to put my back out (still not sure how that happened unless it was from a fall 3 days prior?). So my new Fitbit has not completely motivated me as I assumed it would (even though as a piece of technology with promise I love it). And the weather has also been quite temperamental and even the best days we had were NOT the best for my health. However the point here is that I have been focusing on the areas I want to fix – before I feel ready to embrace myself and another. And this is exactly what I share each month that is NOT the answer. It means I feel I need to fix, heal, change, manipulate or control from a ‘doing’ place and won’t be happy until I have done this. My BEing place knows that I no longer want to BE a sugar addict and I am changing this because it is for my Health and Well-BEing. Nonetheless feeling like I have something wrong with me (an addiction) doesn’t help my self-confidence or help me embrace the Divine Essence within me. Instead, like many others, I have shame, guilt and embarrassment around my Self and this doesn’t allow me to fully Embrace the Beloved within. I am not seeing the Divine Goddess that I am. I think quite often we shame and guilt ourselves and this is something we have learned at a very early age. We fear we are unworthy of Love and Acceptance and we unconsciously sabotage the Divine Worthiness of just BEing Who we Are. We learn these behaviors from our parents and each generation before us has learned this behavior. It is within the collective unconscious that we feel unworthy. And sometimes if feels no matter how often we hear this we are unable to embrace the Divine within us. My hope and intention this year is to uncover the Truth behind my fears and to Embrace the Divine Goddess I know exists within. This is to let go of the shame and guilt that I hold around different areas in my life, like my health and body. This is to know beyond any doubt that my Divine Essence is Perfect and my body is just catching up with the Beauty within, Reflecting my Truth. I want to know beyond a doubt that I am worthy of Love and Acceptance. I will know that I can unconditionally Love and Accept others from this place of my Divine Essence. I will know LOVE – for our deepest wish is to Love and BE Loved. I will uncover the Beloved within myself and Embrace this throughout my Being. So this year’s theme for Love Month is more contemplative then previous years. It is to focus on what I Dream most: to not only receive Love but to offer Love; to not only have Love but to understand the Divine Love within. Michelle Gordon wrote the 9th book of the Earth Angel Series named “The Twin Flame Reignition” (released Jan 20th, 2018) and within this fictional – and known to be prophetic book, my character in the book meets her Flame and travels to England to connect up with Michelle at a retreat. Maybe not surprisingly I was recently offered accommodations (prior to the publishing of the book), meals and a retreat in a Castle in England for my next birthday (courtesy of Tom Campbell). I have a feeling that this year will bring more than I expected but exactly what I Dream Big about! 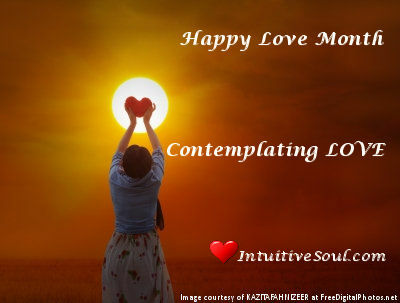 This entry was posted in Blog and tagged #self-love, Contemplating Love, Divine Love, Happy Love Month, Intuitive Counseling, intuitive counselor, Laurie Huston, Michelle Gordon, Tom Campbell. Bookmark the permalink.